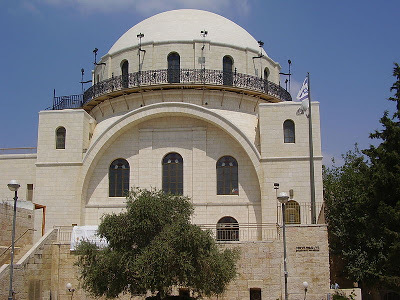 One of the most impressive synagogues in the ancient Jewish Quarter in the Old City of Jerusalem was originally built in the 16th century, but was destroyed by the Ottomans. The synagogue became known as the Hurva, which means The Ruin, because its erconstruction in the early 19th century was begun and then abandoned. 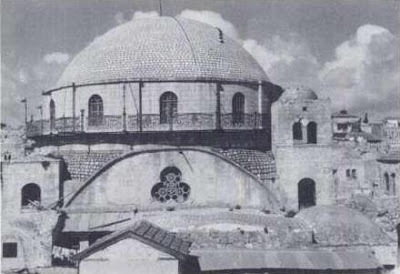 It was finished in the 1850s but the dome was badly damaged during the battle for Jerusalem in 1948. When the Jews surrendered to the Arab Legion and left, it was still standing. 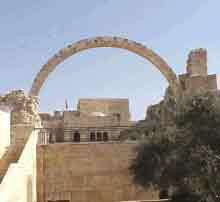 When Israeli forces recaptured the Old City in June 1967, the Hurva looked had been destroyed, with only an arch still standing. After the war, there was a debate over whether to rebuild the synagogue or leave it as a war memorial. No decision was made and it was not until 2010 that the synagogue was restored to its former glory. It is now used as a place of worship, study and a tourist site. Source: Yaacov Lozowick, We Must Rebuild the Hurva! Israel State Archives, (June 27, 2013). Photos: Wikipedia Commons, Mitchell Bard.